About six years ago, Google launched Apps for Your Domain, which, for the first time, wrapped its suite of emerging cloud products under one umbrella — as a service for businesses and the enterprise. The service combined Gmail, Google Talk, GCal, and Google Page Creator, offering the suite to businesses, non-profits, and schools for free, with no hardware or software required. Thanks to something called “the cloud.” Today, the service is better known as Google Apps and is, according to Google, being used by at least 4 million organizations, with some 40 million-plus end users. Yet, as the Google Apps ecosystem has expanded, and its tools have become integral to the day-to-day operations of millions of businesses, many are looking for better ways to monitor, control and secure end-user access to apps like Google Docs, Sites, and Calendars. That’s why BetterCloud launched earlier this year — to provide a suite of complementary products that provide Google Apps with enhanced management and security tools for both IT admins and end users. To help it get off the ground, the New York City-based startup has raised $2.2 million in seed funding from undisclosed angel investors. BetterCloud will use the capital to accelerate the development of its security and management tools and broaden its strategic partnerships, says founder and CEO David Politis, who left his position running the SMB group at Cloud Sherpas (one of Google’s top enterprise partners, which recently merged with GlobalOne) last year to launch the new company. At Cloud Sherpas, Politis helped hundreds of organizations transition to Google’s cloud products, and led the development of its management tools for Google Apps. Prior to Cloud Sherpas, Politis was a founding employee at Vocalocity. When Politis left Cloud Sherpas, he brought a handful of his team members with him, along with the IP and customers database of SherpaTools, the companion app for Google Apps that offered advance IT management functions for admins and end users that he and his team helped develop. If the concept behind SherpaTools sounds familiar, that’s because it is. Politis and team are retiring SherpaTools, replacing it with a new and improved product, which launches today in tandem with its funding announcement. The new app, called FlashPanel, is available today in exclusive beta (the first 500 readers can sign up on its landing page), with public availability in the Google Apps Marketplace slated for the summer. FlashPanel follows the February release of BetterCloud’s first product, DomainWatch, a Google Apps security tool for domains, created to ensure greater visibility and control for IT admins over their users’ activity. Politis says that he thinks the funding represents a validation of the maturity of the Google Apps ecosystem, and, in turn, the need for organizations to get better ways to make the most of Google’s products, both in security and management for admins and end users. 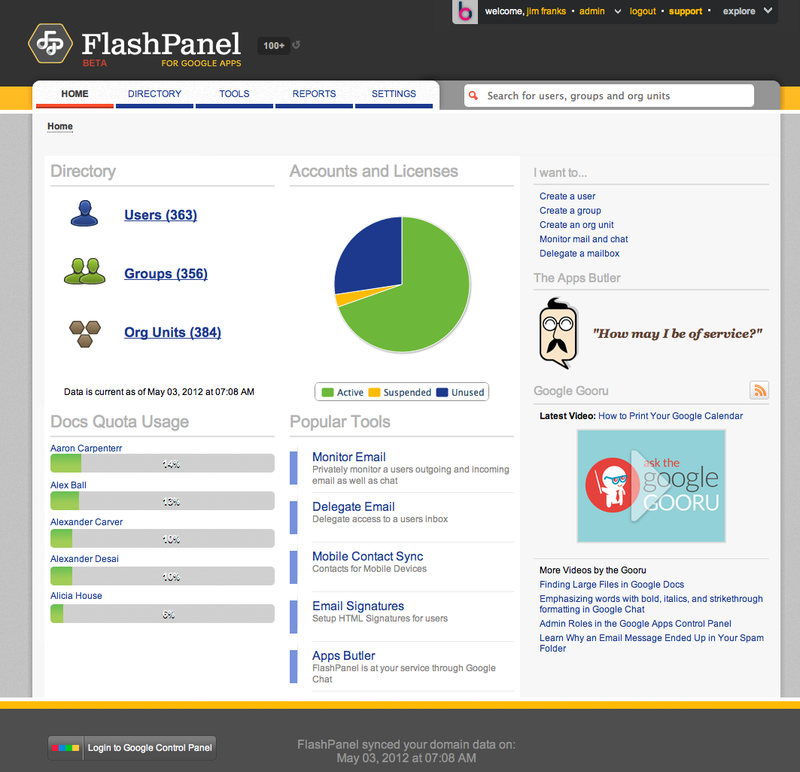 So what is FlashPanel? The management tool offers IT admins comprehensive domain management from one dashboard, giving them access to info on users, groups, and organizational units, Google Docs quota usage, as well as a chart profiling active, suspended, and unused seats. BetterCloud also wants to provide granular management, as some small companies may not use CRM tools, so the suite offers shared contact management, which admins can use to disseminate information to individual users and sync with their mobile devices, add users to new groups, shuffle them around, remove them, or back up inboxes — which gives them a standard template to make it easier for onboarding new employees and deprovisioning those who’ve left. FlashPanel also offers email signature standardization so that businesses can create a unified brand image for their employees, and its so-called “App Butler,” which users can enable via Google Chat to retrieve company directory contact info on-demand or broadcast company-wide events. In addition, the suite includes scheduled and on-demand scans of domain activity, stats, email inbox monitoring, and delegation, as well as a product called Google Gooru, which offer companies training videos on each new Google Apps feature as they’re released, making it easier for admins to get employees using new features without the hassle of having to create their own or hold company-wide onboarding sessions. As the Google Apps ecosystem continues to grow and develops new products and services around Vault, Chromebooks, and Android, BetterCloud wants to be the end-to-end service that provides the best management tools — for everything from domains and groups to reporting, security and compliance — for Google’s enterprise suite. For more on BetterCloud, check ’em out at home here.